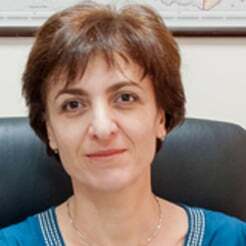 Magda Avetisyan currently serves as ME&A’s Chief of Party for the Advanced Science & Partnerships for Integrated Resource Development (ASPIRED) Project for the USAID Mission in Armenia. ASPIRED is designed to support sustainable water resource management and sustainable practices of water users at the core of the water-energy nexus through the use of science, technology, innovation and partnerships approaches. Previously, Ms. Avetisyan served as ME&A’s Chief of Party for the USAID-funded Armenia Clean Energy and Water (CEW) Program in Yerevan, Armenia. With more than 25 years of management experience, she has worked on a wide range of development projects with other international organizations such as CHF International, World Learning, International Executive Service Corps, International Fund for Agricultural Development, YMCA, and Human Dignity and Peace Foundation (HDPF). Before joining ME&A, Ms. Avetisyan held several senior management positions including Deputy Country Director and later Acting Country Director for the USAID Small Scale Infrastructure Program and Deputy Chief of Party for the USAID BRIDGE Public Works Program. She also served as Training Coordinator for World Learning/International Executive Services Corps under the USAID NGO Strengthening Program and Project Manager/Monitoring and Evaluation Specialist for the HDPF Project supporting people with disabilities in Armenia. Ms. Avetisyan holds Master’s and Bachelor’s degrees in engineering from the Yerevan State Engineering University. She is fluent in English, Russian, and Armenian.